We capture photos of our missionaries and the work they are doing around the world. The photos are curated here in a large searchable catalog of photos and collections. Churches can use the photos for free to cast vision for world missions in their local context. New images and collections will be posted regularly. Broken columns from the ruins of the ancient agora of Smyrna. The agora suffered many earthquakes, including the great quakes of 115, 178 and 526 AD. A Roman market was supported by a net of vaulted underground passages which had the objective of reducing the impact of earthquakes. Stone arches, flowing water and pillars above in Smyrna. Columns stand at current-day ground level of Izmir, Turkey above the excavated ruins of buried Smyrna. Animals are sacrificed daily in Tengzug village, Nothern Ghana, for forgiveness of sins and to seek blessings of ancestors. 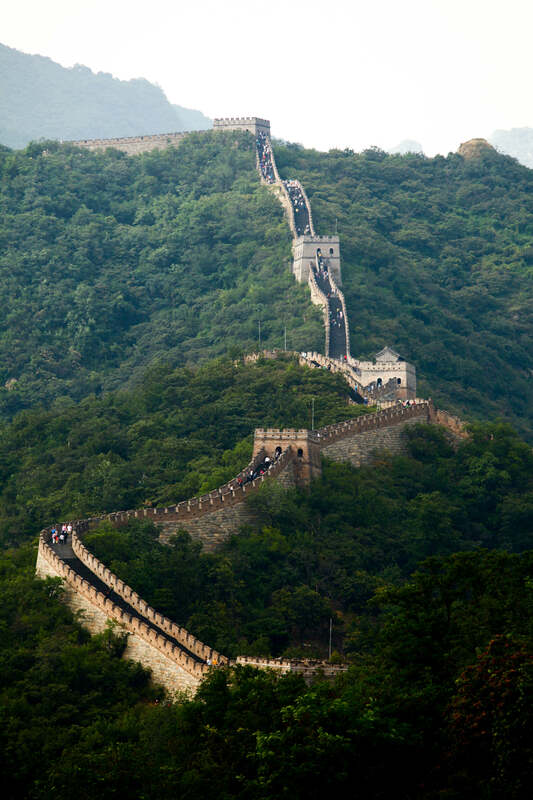 The Great Wall of China stretches approximately 5,500 miles from east to west of China. With a history of more than 2000 years, some of the sections are now in ruins or have disappeared but it remains one of the most visited landmarks in the world. India is a land and people of contrasts. Walk down any street, and you’ll find a variety of religions, economic statuses, and cultural differences. In Agra, tourists flock to see the Taj Mahal (aka “the Taj”), a mausoleum built by Mughal Emperor Shah Jahan in memory of his favorite wife, Mumtaz Mahal. The Taj Mahal is considered the finest example of Mughal architecture and is often considered one of the wonders of the modern world. Architectural details of a building in Central Asia. With almost six million residents, Kunming is the largest city, and the capital of southern China’s Yunnan Province. Kunming forms the center of the province’s economics, communications and culture. The “Church of Holy Wisdom”, Hagia Sophia is among the world’s greatest architectural achievements. More than 1,400 years old, it stands as a testament to the sophistication of the 6th-century Byzantine capital and had a great influence on architecture in the following centuries. The vast edifice was built over two earlier churches and inaugurated by Emperor Justinian in 537. In the 15th Century the Ottomans converted it into a mosque: the minarets, tombs, and fountains date from this period. To help support the structure’s great weight, the exterior has been buttressed on numerous occasions, which has partly obscured its original shape. The ruins of a temple of the goddess Artemis at the remains of the ancient Roman city of Gerasa in Jerash, Jordan. Gerasa was one of the ten cities of the Decapolis (“Ten Cities”). Editing code for a website. Writing down thoughts with sticky notes. A woman listens to the sermon during an outside church service. A woman stares out of the window of a church waiting for the service to start. A group of local believers pray at a church service in a village in Ecuador. A group of local believers pray at a church service in a village in Ecuador. This man was saved in 1975 through a radio ministry. The group of church leaders meeting at San Roque Church take a few minutes to play a few of their traditional worship songs for the rest of the group. Local believers have a Bible study for the church leaders in Quinchuqui, Ecuador. A service takes place inside Notre Dame Cathedral in Paris, France. The front doors of Notre Dame Cathedral in Paris, France. Images of the architectural details of Notre Dame in Paris, France. Tourist walk in front of Notre Dame Cathedral in Paris, France. Rice fields wait for night to fall on island of Flores in eastern Indonesia. Bill Wallace performs surgery at Stout Memorial Hospital in Wuzhou, China. Daily life in the historic district of Coyoacan in Mexico City. The city of more than 20 million draws a steady stream of internationals coming for business and tourism. A volunteer doctor examines a patient on clinic day at the Baptist Medical Centre in Nalerigu, Ghana. Without any roads between jungle villages, motorboats and canoes provide the primary mode of transportation for the Warao. A cheerful boy from Nairobi, Kenya, stops to have his portrait made. A Karamojong man smiles for the camera. The Karamojong are semi-nomadic cattle herders who live in a harsh and unforgiving environment. Though they are known to raid other people groups and even their neighbors to steal cows, they are also a very generous and accepting people. Two Karamojong children pose for the camera in Uganda. Beads are a sign of wealth among the Karamojong, an unreached people group numbering 537,000. The Karamojong, an unreached people group in Uganda, are well-known for their scarred tattoos on faces and other parts of the body. The tattoos signify beauty, adulthood, or other cultural meaning. A Karamojong girl smiles for a picture in Uganda. Beads are a sign of wealth among the Karamojong, an unreached people group numbering 537,000. A Karamojong child relaxes in the shade in northeastern Uganda. The Karamojong are an unreached people group numbering 537,000. Portraits of Turkish children and teenagers staying cool in the local streams and waterfalls in Tarsus. At the place where the waterfalls are located, there are underground rock graves remained from the Romans. The graves can be seen from time to time when the water level changes at different parts of the year. National workers have gathered together to help prepare buckets filled with food to hand out to flood victims in Dhaka, Bangladesh. Hundreds of food buckets were prepared with the intent of distributing them to flood victims in Dhaka, Bangladesh. The government refused to grant permission for the food to be handed out to the Bengali community. Bengali workers help prepare food intended for flood victims in Dhaka, Bangladesh. Bins of food prepared for flood victims in Dhaka, Bangladesh. A man walks up the church aisle carrying the offering plate. IMB workers write on a chalkboard the results of how they’ve seen the Lottie Moon Christmas Offering used on the field. Kathy, second from right, an IMB missionary to unreached people groups in the Amazon region, and other members of her team pray before a meal prepared in the home of believers who live in the rain forest. The offering is received at the Sunday morning service of McCall Baptist Church in Havana, Cuba. Church members walk to the front of the room to place their offerings in the offering plate. Coins saved for a missions offering lie on a zip-top bag. Church members pass the offering plate from one family to the next. Church members pass the offering plate where they place their money to fund missions. People in Mexico City gather for a church service. A portrait of David Hesselgrave teaching. Billy Graham ministering to children in Africa. Over six decades, Billy Graham proclaimed the gospel simply and fearlessly in stadium events in more than 180 countries outside the United States, like this 1960 gathering in Bulwayo, Zimbabwe. A historical photo showing the aid hospital in Yemen. Children playing in China in the 1930s. College students enjoy the sunset on the holy mountain overlooking Osh, Kyrgyzstan. Traditional Kyrgyz patterns adorn the side of a yurt in Kyrgyzstan. In the ancient world, traders carried ideas and beliefs along the historic Silk Road. Now the world is bringing its ideas to Central Asia. A Kyrgyz man performs traditional songs for a group of visitors from inside a yurt in Kyrgyzstan. IMB missionaries to Japan gather for a meal with friends. The couple met when they were both serving in Japan as Journeymen and have since gotten married and planted their family there, saying they believe God is at work in the hearts of the Japanese. Men study the Bible during an adult education class led by an IMB missionary. He and his wife spend many of their Sundays partnering with local churches in Mexico City, such as this one in the Barros Sierra neighborhood. A sunset overlook of the city skyline. IMB missionaries serving in Mexico City meet often with local partners to strategize how they can work together to reach the city of more than 20 million people with the gospel. Believers pray during a worship service in Nepal, a country where it often takes people years to decide to follow Christ after they hear the gospel for the first time. Pray for IMB workers who are giving their lives to be there for the long haul, sharing with the Nepali people in the face of difficulties. IMB short-term workers hike a Himalayan peak nearly 15,000 feet in elevation. It takes multiple weeks just to access many Tibetan villages from the capital city of Kathmandu. A missionary returns on a boat from the southern Congolese port city of Moba back to Kalemie, stopping at a Taabwa village along the way to talk with villagers. Calvary Baptist Church of Lynchburg VA. Member of a local church. A doctor and patients at a clinic in Africa. A boy happily plays his guitar on the side of a street. Music is the heartbeat of culture and entertainment in the Americas. A boat is an important means of transportation on the Amazon River in Brazil. Many families must travel down the river in order to reach bigger cities. Traveling by boat, instead of trekking through rainforests, can significantly cut down on travel time. A woman in her traditional outfit proudly displays her embroidery at a festival. Textiles in Central and South American countries can be displayed as artwork, worn, used for decoration, or utilized in ceremonies. Two Christian workers visit the Boca Inambari community. Their normal trips are ten weeks long visiting several communities. While in the communities they develop relationships and share the Gospel, primarily through storying. Portrait of the president of the Boca Inambari Community. His father is painting his face with the traditional markings of a warrior. The Lima Cathedral in downtown Lima. The very ornate ceiling (with Arabic calligraphy, designs and stained-glass windows) of the Blue Mosque, or the Sultan Ahmet Camii Mosque, in Istanbul, Turkey. The mosque was founded by Sultan Ahmet I, and construction was completed in 1616. A man in Turkey gazes out his window. Turkey is a divided country, split between those who want to maintain a secular democracy and those who hope for a more Islamic society. A farmer brings his crops of apples in the trunk of his car to sell in Baku city. Nuts and legumes are sold in street bazaars throughout Central Asia. In many Central Asian towns, families shop in local bazaars to buy food and clothes. A woman tends to her herbs and pomegranates. In some Central Asian locations, farmers from the country bring produce to the city to sell in the bazaars. This image was taken during Friday prayers at a small mosque in Baku. The crowd reached well over 1,000 inside and out so people had to flood into streets to lie their prayer mats for prayer time. The crowd was all men. South Korea, Seoul: A scene of daily life in the modern, bustling capital city of South Korea. A South Asian Deaf believerbdiscusses ministry among the local Deaf community in his South Asian city. A volunteer works with the deaf community in Japan. She has joined different clubs including a quilting club in order to share the Gospel with them. People in the streets of Buenos Aires. People commuting to work in the streets of Buenos Aires. Students at Purwanchal School for the Deaf chat in sign language during class. A Nepali Christian speaks to women at a church a few hours outside Kathmandu, Nepal, about the value they have in Christ. Students at Purwanchal School for the Deaf chat through sign language during class. The Great Wall of China between Janshaling and Mutianyu, near Beijing, China. A man who belongs to the Bai people group, who are unreached, takes a picture with his flip phone. Although China is a major hub for technology, many people choose to use what they know and love. A farmer in East Asia dries her harvest of corn on her rooftop. The livelihood of farmers depends on the quantity and health of their harvest. Celebrations are often thrown for bountiful harvests. Bamboo forest outside of Osaka, Japan. Naritasan Shinsho-ji is a Shingon Buddhist temple located near Tokyo’s Narita airport. Traditional calligraphy paint brushes for sale in China’s Yuyuan Bazaar & Gardens in the traditional Old Town (Nan Shi) area of Shanghai city. A temporary migrant camp at Idomeni, Greece, at the border with Macedonia. The Macedonian government has erected fences and razor wire to prevent migrants from Syria, Afghanistan, Iraq and other countries crossing the border from Greece. Flags from numerous countries line this street in London. Cultural diversity is celebrated as well as the unity of the nations. Jelacic Square in Donji Grad (or Lower Town) is the most poplar hang out in the city for both young and old. Many kids, teenagers, and adults meet in the square for coffee, to play, or for a business lunch in one of the many outdoor cafes. The city of Zagreb is divided into two large sectors; the old town Gornji Grad (or Upper Town) which includes two districts that are situated on the hills. There is much diversity in Europe, both religiously and ethnically. The life of a vendor requires much work. They are constantly turning over products, but despite this grueling effort, many find joy in this job and have the opportunity to meet many people. Festivals are a large part of European cultures. Dressed in traditional clothing, these women perform to keep their culture alive and celebrated. An image from the Gerber Festival in Debyosi, a town in Udmurtia Autonomous Region, Russia. The festival is the premiere annual Udmurt cultural event. Scenes include dancing, cooking, eating and drinking, and various floats including characters depicting various stages of Udmurt history. Many countries in North Africa and the Middle East experience extreme weather. This young boy is wearing clothing that may not seem conducive for the hot environment in which he lives, but local residents adjust to the weather and environment of their home country. The Vipassana Dhura Buddhist Centre of Kingdom of Cambodia is scene to behold. With many elaborate and intricately decorated temples and buildings, the Buddhist Centre can be quite overwhelming. Located north of Phnom Penh, Cambodia, the centre raises money for the buildings and the monks. Pomegranates, figs, olives, and plums can commonly be found in most markets across North Africa and the Middle East. Many of the recipes made by locals also contain these ingredients along with bread or rice. Early in the morning, the Orthodox walk to church, bow and cross themselves three times. For the next two hours, they put their face to the ground, praying to Mary, to absolve their sins. Then they leave, hoping their sins are washed away for the next week. For Muslim men, wearing white and praying daily are ways to show dedication to their religion. In the kneeling position, they show their humility before their god, Allah. Many devout worshippers pause to pray 5 times a day as directed by their holy book, the Koran (Quran). Mosques are often seen as a place of unity, peace, and tranquility for Muslims. Here, two young boys walk in the mosque. Many mosques are beautiful in appearance, but the blank walls and empty halls signify a deeper reflection of the emptiness the religion leaves in its devoted followers. An elderly Indian woman holds her well worn Bible as she waits outside her church. Laborers pause as they build a home outside of Dhaka, Bangladesh. An autorickshaw is decorated with strands of marigolds to celebrate the famous festival of light known as Diwali. The Hindu festival symbolizes victory over spiritual darkness. This is one of the most famous festivals on the Hindu calendar. A Sikh man prays as he enters the Golden Temple in Amritsar, India. The bustling Maning fresh produce market in Colombo, the capital city of Sri Lanka. Young monks in Bhutan learn from an older monk outside a temple. Many young boys become monks both for the perceived spiritual benefit and for the benefits of food, education, and lodging. Men and women crowd local trains in hopes to arrive at their destinations without having to wait to catch another train. Myanmar (Burma): Bagan. A Buddhist monk walks in the shade of a covered walkway at Shwezigon Paya temple. As a storm builds over the lake, rice seedlings are hauled ashore from a slim, human paddled boat in Southeast Asia. Mountains and a hot, humid, climate contribute to fast moving rainstorms. A young woman dressed in traditional clothing sits on the front porch of her house and shows off her fashionable attire. Villagers pan for gold in a river in northern Vietnam. Thai Buddhists participate in the Yee Peng Sansai Floating Lantern Ceremony on Saturday, Oct. 28, 2006 outside of Chiang Mai, Thailand. Participants lit and released over 3,000 lanterns in an annual ritual to try and lift wishes to heaven. This annual ceremony is a week prior to Loi Gra Tong Festival where residents will continue the practice to cleanse themselves throughout the week. The art of weaving is still ever-present in many parts of Southeast Asia. Many shoppers delight in the intricacy and beauty of handmade items like bamboo mats and cloth or fabric rugs. A woman stands in a rice field where she gathers stalks. Despite the hot weather, humidity, and insects, many of these workers do their jobs with joy and see it as an opportunity to give back to their families from the income they earn. A church member looks out of Treichville Baptist Church’s unique sanctuary windows in Abidjan, Ivory Coast. In an urban setting in the Democratic Republic of Congo, this man reaches his hand out as a welcome. The urban skyline of Johannesburg, South Africa, as seen from the top of the Carlton Center, the tallest building on the continent. A masked Mamprusi man in northern Ghana performs as the “Doorudoo.” The tradition occurs during the Muslim month of Ramadan when youth from the community don the costume and playfully dance in courtyards to collect money and food for their end-of-Ramadan feast. Many who live in the deserts of Africa travel for miles to bring water to their families. This man reads and studies intently in the dark with the little light he has. This young girl helps prepare food with her family. A Christian worker puts more medicine on a woman’s arm to treat a burn in Kayar, Senegal. A volunteer medical student prepares to operate on a Fulani woman at the Baptist Medical Centre in Nalerigu, Ghana. An IMB missionary and volunteer medical student operate on a Fulani woman at the Baptist Medical Centre in Nalerigu, Ghana. A volunteer medical student assists an IMB missionary in performing a c-section at the Baptist Medical Centre in Nalerigu, Ghana. 4th year medical student volunteers examine an x-ray at the Baptist Medical Centre, in Nalerigu, Ghana. An IMB missionary instructs volunteer residents as they perform a Caesarean at the Baptist Medical Centre in Nalerigu, Ghana. Portraits of Turkish musicians as they prepare to perform. Taken in Naranjito, a mountain village just outside Ibarra, Ecuador. A group of Imbabura Quichuan people form a huddle outside the Baptist church in Naranjito to perform traditional Quichuan music, characterized by stringed instruments and high-pitched singing. Members of “Cristo la Luz del Chirihuasi,” a traditional Baptist church in Chirihuasi, Ecuador, meet for worship on a Sunday morning. Imbabura Quichuan believers join their voices to worship with traditional Quichuan singing. A group of Imbabura Quichuan people form a huddle outside the Baptist church in Naranjito to perform traditional Quichuan music, characterized by stringed instruments and high-pitched singing. Taken at an outdoor house church meeting in Paniquindra, Ecuador. Here, Imbabura Quichuan believers incorporate traditional Quichuan music styles into the worship service. Members of “Cristo la Luz del Chirihuasi,” a traditional Baptist church in Chirihuasi, Ecuador, meet for worship on a Sunday morning. Following the morning worship service, three Imbabura Quichuan believers gather to play traditional Quichuan music. Many Chinese temples incorporate water and plants for aesthetic and symbolic purposes. Here a sculptural miniature bonsai tree graces the courtyard of Singapore’s Lian Shan Shuang Lin temple. A small boat rests quietly on a still lake. Modern-day ez-Zeifah is currently referred to as the “Wilderness of Ziph” in Scripture. David fled to the wilderness of Ziph when Saul was pursuing him. This is also the area where Saul built a monument to commemorate his victory over the Amalekites in the book of I Samuel.